When you start looking for your first job, you are going through many changes in your life. 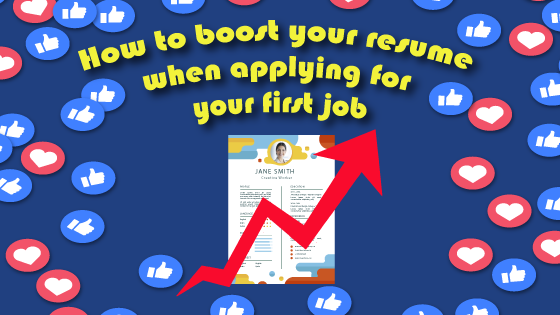 It´s kind of “your year of firsts” like your first car, or your first job hunt, or… your first resume! And you may think, how am I going to impress someone with a resume without work experience!? It´s a challenge, but we are going to give you some tips to boost your resume when applying for your very first job! Let´s start by saying that having a resume that stands up isn´t about having colorful and fancy templates; it may be the icing on the cake, but recruiters care about the substance. So, the first tip is: Highlight education and skills. Write your top six to eight skills and try to make them match the profile that the recruiter is looking for, convince them that you’re the right fit. Making the recruiter hunt all over the resume to know your skills or degree is annoying, so try to detail this at the beginning of your resume, this will make them want to read more about you. Remember to include not only the school you went and the degree you received, but any other achievement you accomplish like being the President of your classroom, internships you have held or any other volunteer work you got involved. Second Tip: Leave out what is not relevant! Try to give information about those things that demonstrate you’re the perfect person for the job. Leave out things that doesn´t have any relation with the requirements the company is looking for. For example: if you are applying for a web developer job, any internships or courses related to that specific area will be valuable so… go ahead! Write that down, but please leave out any information like “First Place Winner of Spelling Bee” or “Won award for eating 20 hamburgers in 30 minutes” Congratulations but, sorry, that´s not going to boost your resume, so leave that out. Knowing any other language rather than your native one is a plus nowadays for the companies. So, try to leave some space on your agenda to learn a new language and don´t forget to write that down on your resume, that will totally boost it and you can get better chances to get hired. Our fourth tip is: Keep it short! Since it is your first resume, it should not be longer than one page, that´s why you must write just the important things about you. Try to make it look neat and specify just the information that really matters and, again, matches the profile the company is looking for. Also, remember to double check your resume before sending it for spelling or grammar mistakes. And last but not least, our fifth tip is: Be careful with fonts, colors, and formats. Please don´t use fancy fonts or curly tail fonts, they´re extremely hard to read and the recruiter will lose any interest in continuing reading your resume. Try to use nice colors, but not too many because that will definitely distract the person who´s reading it. Choose a nice and neat format for your resume and you’ll see how all your information will look perfectly on it. As curious fact, recruiters spend just 6 seconds to read your resume, that´s why you have to get their attention on the first part of it. At Altia Business Park you will be able to get a great job opportunity even if you don’t have work experience. So, what are you waiting for? Please get up, create your first resume with these tips we just gave to you and send it to our email rrhh@altiabusinesspark.com Let your “Year of Firsts” begin with us.